In the first issue of The Moorestown Sun 10 years ago, the Sunnybrook Swim Club had a featured picture of two of its charter members, Alice Hodgen and Barbara Carey, as they celebrated the club’s 50th anniversary. The Sun checks back with the Sunnybrook Swim Club for its 60th anniversary to see what has changed, what hasn’t and what has been accomplished in the past 10 years. Sunnybrook has operated as a non-profit swim club owned and managed by its members through bonded and rental memberships. The club originally started with 160 memberships, and since has grown to include 325 memberships, of which 300 are filled. “The Sunnybrook Swim Club is a community. It’s a place in the community where families, friends and children can come together and have fun around water sports like swimming and diving,” Tom Trasser, the club’s previous board president, said. “It’s such a family-oriented place. It’s a nice place to go and relax with your kids. I love, love, love Sunnybrook,” said Susannah Zimmermann, parent coordinator for the swim team. Sunnybrook was established in 1955. 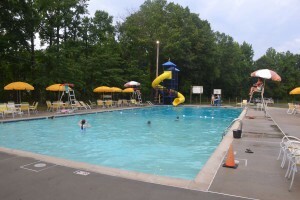 The club has two large pools and a kiddie pool as well as basketball courts, horseshoes, a shuffleboard court, a playground, waterslide and privately-managed snack bar. Shaded by mature trees, the club is nestled in a quiet neighborhood off Devon Road. 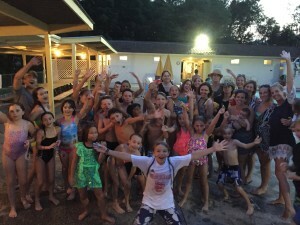 It is the only outdoor swim club in Moorestown. “When you’re back there, you feel like you’re in the Poconos or something. You look around and can’t see any houses, which is unique in Moorestown,” board president Peter Cronk said. The club offers youth competitive swim and dive teams, providing a safe, familiar and supportive environment for entry into competitive swimming and diving. The Makos are Sunnybrook’s summer swim team. The team is open to children ages 5 to 18, offering two teams — the Makos and the Mini-Makos. 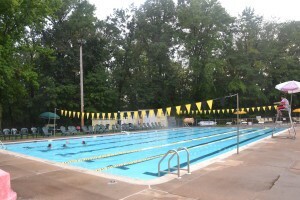 The swim season runs from May to August and participates in the Tri-County Swimming League. The purpose of the program is for children and teens to learn and train for the sport of swimming. This year, the swim team accomplished an amazing feat, winning the division and advancing to the A division for next year. “It is fantastic for us. We had a great swim season this year and are excited to give the A division a shot,” Zimmermann said. The Sunnybrook dive team offers children and teens, ages 6 to 18, the opportunity to learn and train for competitive diving. The program is great for children preparing to compete in high school or for additional practice throughout the summer. The program runs May to July and includes four events, participating in the South Jersey Diving League. The dive team has seen some success as well. On July 23, the team finished in seventh place out of 20 clubs. Last year, it won the South Jersey Diving Association championship, the first time any team has won in Sunnybrook. Altogether, there were 45 qualifiers this year for the Tri-County meet, which was held on Aug. 1, and 2 at Greenwood Park in Blackwood. One of the great and unique things about both of the teams is they are very supportive of each other. Everyone contributes the same amount at meets, no matter the age. This makes for a very supportive and caring environment, almost like family. “Everyone just roots for each other. It’s a really unique sports experience in Moorestown,” Cronk said. For its 50th anniversary, the club celebrated with a barbeque, and this year for its 60th, it celebrated similarly, but on a larger scale. About 300 of the members, coaches and alumni came out on July 11 to enjoy live music, swimming, hotdogs and hamburgers provided by the board, and side dishes brought by attendees. “Typical Sunnybrook: family, friends and fun,” Trasser said. The club hasn’t changed much in the past 10 years, except the growing membership and adding things such as a new slide, but that is what makes the club so special, according to Trasser. “I think part of the beauty of the club is that it has remained very much the same,” he said. In the future, there are two things the club would like to work on — social activities and the club’s infrastructure. According to Cronk, they would like to add more teen activities and create an alumni party, either in conjunction with the senior send off or as a separate reunion party. There is some infrastructure work that needs to be done at the club as well, including a pavilion. They want to be sure the infrastructure is well maintained and up to date to support another 60 years. “Another 60 years would be great,” Trasser said. For one of the projects, Sunnybrook is selling bricks that will be put in a walkway between two of the pools. The bricks will have dedications on them and are about $100 each. More information can be found at the club or online at its website, www.sunnybrookswimclub.org. Membership is open to all families in Moorestown. Sunnybrook would love to reach its full membership, and there are still 25 spots available. Sunnybrook opens Memorial Day weekend and operates Saturday and Sunday only until the school year ends in late June. When school is out, the club is open seven days per week from noon until 8:45 pm.